Photosynthesis on land (~ 55%) and photosynthesis in the ocean (~ 45%) account for nearly 100% of Earth's atmospheric oxygen. A fraction comes from the breakup of water (photolysis) from ultraviolet radiation. "The oxygen in today's atmosphere is almost entirely the result of photosynthetic living, which had its start with the appearance of blue-green algae among the microorganisms." Plants, algae, and cyanobacteria perform photosynthesis which maintains atmospheric oxygen and supplies all of the organic compounds and most of the energy necessary to sustain life in Earth's biosphere. "One hundred and fifty years ago, the monster began, this country had become a place of industry. Factories grew on the landscape like weeds. Trees fell, fields were up-ended, rivers blackened. The sky choked on smoke and ash, and the people did, too, spending their days coughing and itching, their eyes turned forever toward the ground. Villages grew into town, towns into cities. And people began to live on the earth rather than within it." 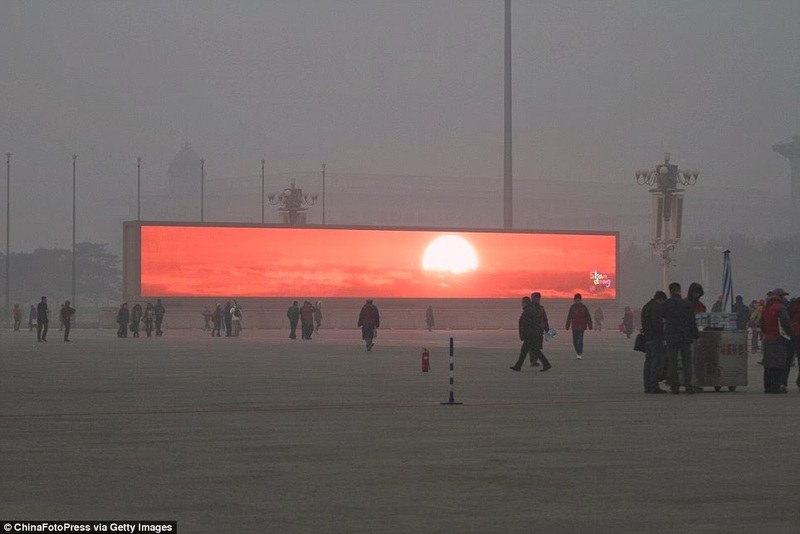 while Beijing is shrouded in smog. 16 January 2014. 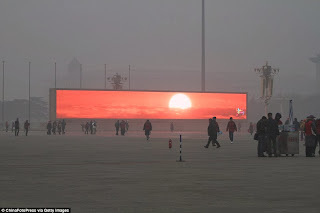 China starts televising the sunrise on giant TV screens because Beijing is so clouded in smog, by James Nye, Daily Mail, 17 January 2014. Late Night Thoughts on Listening to Mahler's Ninth Symphony, Lewis Thomas, 1995.